Summertime is finally upon us and what better way to celebrate than with the release of ColeCo’s appropriately titled and long anticipated “El Verano” EP! After having received major support from DJ’s across the globe, the Nu-Disco banger “Ricky Smiley” is the feature track off the EP along with three other stellar tracks to keep you dancing all summer long! 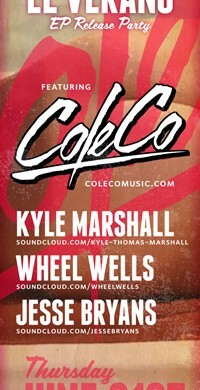 To celebrate the release, ColeCo will be performing at The Drake Underground Thursday June 21st with The Wheel Wells, Kyle Marshall, and Jesse Bryans.